I recently participated in a Webinar led by Zac Woolfitt, a lecturer at Inholland University in The Netherlands, who has researched the effectiveness of using video in higher education. Based on his research, Woolfit made some recommendations that made a great deal of sense to me. First, he noted that videos should not be very long—10 minutes at the very most. Woolfitt believes that 3-5 or 5-7 minutes, depending on the topic, is optimal. Take much longer topics and break them up into smaller chunks that will keep students’ attention and allow them to easily digest the main point of each video. Woolfit especially promoted what he referred to as the “theory of constructive alignment.” Simply put, develop a clear student learning outcome for each video you make and connect some type of assessment to that video. He suggested that the main point of each video should become a question on an exam or quiz. However, he also suggested using other types of classroom assessment techniques to reinforce the content. For instance, instructors can have students teach the main point of an assigned video. In a hybrid or “flipped” classroom, break the students into pairs; assign each student a separate video and have them teach the main concept to their partner. 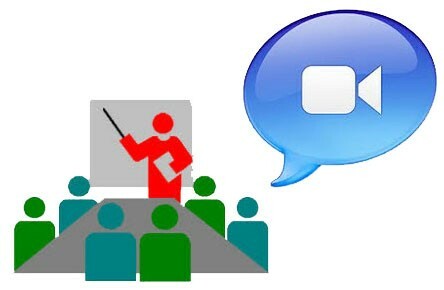 In a purely online class, students can be assigned to summarize the video in a discussion forum. Woolfit advocated requiring students to ask a follow-up question about each video they watch. Whether it’s done as part of a discussion forum, through email, or during a face-to-face meeting, students can ask for clarification or more information and receive participation points. As far as production goes, Woolfit recommends trying to create most videos in just one take. Have a script prepared so that errors can be kept to a minimum. He also advises instructors to keep post-production editing to a minimum. Just like our face-to-face lectures, content (or how we present it) will probably need to be changed on an ongoing basis, so instructors don’t get a great deal of return on crafting perfect videos every time—and students certainly aren’t expecting videos every time. Finally, Woolfit recommends a variety of videos. Sometimes, you might want to do a simple screen capture; at others, you may want to record your PowerPoint slides with you speaking over them. For certain lessons, you may want to actually have yourself filmed presenting a lecture to a live audience. At LCC, instructors have several resources to help them produce class videos. Kaltura screen capture is available within Desire2Learn. You can create more complex and fully edit screen captures using iSpring and Camtasia, which are available in the CTE’s technology support room (TLC 324). Media Services also has a Podcasting suite, which allows for better quality sound and video capture. In the Teaching Technology Sandbox, faculty can have a lecture recorded as they deliver it to an actual class. Please feel free to stop by the CTE during open hours for assistance using Kaltura, iSpring, or Camtasia. If you are interested in using the Podcasting suite or the Teaching Technology Sandbox for Faculty, contact LCC’s Media Services.